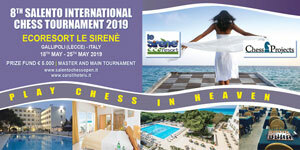 Also this year the chess summer begins in Italy with 8th Open of Salento 2019 – Ecoresort Le Sirenè scheduled from 18th to 25th May 2019. We will have terrific guest players… starting with the reigning champion GM Sabino Brunello (ITA), by the vice Olympic champion WGM Natalia Zhukova (UKR) and by the European champion and European champion, under 12, MF Volodar Murzin (RUS) … but there are many others to discover one at a time! The further novelty is a more balanced distribution of prizes with € 3,100 in the Master Open and € 1,900 in the Main Open, grand total of € 5,000. As regards prize money there may soon be some surprises with the arrival of a new possible sponsor and therefore the increase in the prize pool present. Instead we confirm evening classes of the guests, lightning tournament, tournament of bughouse , matches of football and tennis and morning sightseeing tours in Gallipoli, Lecce, Otranto etc. Thanks once more to Caroli Hotels and Aldo Russo (President of the Accademia Scacchistica of Pisignano) without both we would not have reached the 8th edition (+ 2 Italian Teams Championships Masters and Women on years 2017 and 2018!). The tournament flyer is available in three languages: Italian, English and German. Also this year the chess summer starts in Italy from 18 to 25 May 2019 with the 8th INTERNATIONAL CHESS OPEN 2019 – Ecoresort Le Sirenè. Welcome to the website dedicated to the 8th SALENTO INTERNATIONAL CHESS OPEN 2019!